My personal transformation e-book that I mentioned in a previous blog post is coming along, although it’s like giving birth to an elephant. After hitting the inevitable stumbling block or writer’s block where I have stopped in all previous attempts over the last few years (gawd, that’s a motivator), I’ve gritted my teeth and struggled along determined to continue. I wallowed a lot in the introduction, getting caught up in confusion with how to present my story, the reason I’m writing this, the specific content and how much of the Bilderberg information I should share, not wanting to put anyone off before they even begin. Then I read a synchronistic blog from Leonie Dawson, author of many helpful books and e-courses, some of which I’ve bought and find great – such as the amazingly helpful Business Goddess E-Course. Leonie’s an Aussie woman … goddess… who’s a great teacher for me, especially in terms of seeing how she’s writing what she’s writing and how she manages to turn each blog into a sales pitch that is wrapped up in love, enthusiasm and inspiration. I have to admit that envy sometimes rears its ugly head when I see her posts, as an old voice in my head sneers “What’s the point, it’s all been done before and better and more colourfully!”. But even though I weep inside at the difficulty of bringing the colour out of me – out of the darkness – this spurs me on because I know envy is showing me that somewhere within I don’t believe I can achieve this level of influence myself. That belief is BS I know, but it is a deeply held belief with grungy gapped feelings attached, so work through it I will. Actually, how I work through this kind of soul-sucking woundedness to get back to enthusiastic creativity is one of the topics in my own book. Despite my shadow side feelings for this talented lady, I also truly love her genuine energy and am massively inspired by her ability to express who she is in such a way that she touches thousands. I also went over a few of my past articles on my blog the latest of which I wrote yesterday, and actually like how I write. So I’m coming to terms with the fact that while my book isn’t going to be written in a formal presentation, it will be written in such a way that appeals to readers who are similar to me and who will resonate with what I’m saying and appreciate how I’m saying it. What I have learned from Leonie D is that her strength is in her authenticity. So I don’t have to be like LD to be successful, and the world doesn’t need another LD or even a copycat LD. The world needs me to be me. And it needs you to be you. This book then is pulling me out of me. It is forcing me to find authentic expression in the written word. I’ve already managed to successfully create popular guided relaxation CDs, and even got a couple of positive comments on the home video I made on Sunday of the open studio (much to my surprise.) 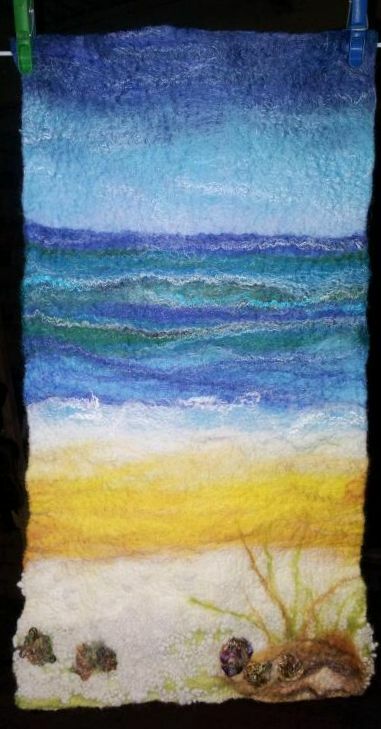 I am also able to translate an idea into a painting or a felt work as you can see from some of my posts here – and even am confident enough with that to stretch my boundaries each time I create a piece of art. So, remembering I have a beautiful, fluffy, mushy, “fill your heart with love and your loins with lust” style contemporary romance (well, two), under my belt and quite a few blog posts I am happy with which are written in a more up beat and sometimes tongue in cheek way, I am digging deeper to discover my e-workbook voice. What I have also learned from watching LD’s sales video is that she talks to her viewers in the same way she writes, to each one personally, as someone she adores and genuinely wants to assist. That makes it very attractive, I think because it is authentic to her and also because she addresses the ‘needy’/’wounded’/’suffering’/’aspiring’ goddess within me/other women. So my book is causing me to research. Not so much on the technical side, but definitely on the way it is written and how it is going to be presented. My friend and mentor Ari’s (Aristomenes Christos Papageorgopoulos) latest facebook article also continued my momentum after reading it this morning. So while my e-book feels like I’m giving birth to an elephant, I’m going to keep writing! I’m going to find and use my own authentic voice. I’m going to make my world turn. And when it’s ready, I’ll publish it for the whole world to read, so anyone who resonates can make their world turn too! I’ve had quite a time this weekend. On the one hand, after seeing my business mentor I feel very conflicted, but on the other hand I’m feeling fulfilled at being creatively productive. I’m in my fifties and I know that in order to have a better quality of life further on down the track and looking towards retirement age, I need to put into place some sensible strategies now in order to create more passive income later. I like the internet and social media (can’t you tell from reading this blog?) and so am looking at using my website to sell more of my creations as well as e-books and e-courses. In my past, I’ve produced guided relaxation cds and these sell well in a couple of reputable businesses in the city and have done for years, and I also have sound bytes on my current (old) website so people can listen to them and decide via the internet instead of going physically shopping. Also in my past – although to be honest it seems more like a past life – I’ve run workshops (creative expression, relaxation, meditation) and love working with people and seeing a transformation through the process. So long-term, creating internet-friendly books and courses to assist people to do this and also free themselves to be more creative, is a concept that sits well with me. Trouble is, my conflict comes because I’m a bit of a short-term pleasure girl. I also have a good excuse to continue this tendency: I have markets coming up and I want to create more silk and felt jewellery, scarves and accessories to sell. Not only for the money. I just love making things. But, I can’t do two things at once given my time constraints and fluffy personality that’s not as organised as I could be if I’m really honest with myself. (I could do with one of those chaise long psychiatrist couches at this point). If I don’t get these e-books etc completed I can’t put them on my website for sale and I haven’t advanced any further towards my long-term goals. Do you ever find yourself conflicted with “should do” vs “creativity now”? Anyway, this whole dilemma has left me feeling a tad irritated. So, have I been working on completing my other e-things this fine dry Australian autumn weekend? No. And anyone who knows me would add: “of course not”. and before we go any further, I know I can finish a book because I have a completed contemporary romance on Amazon Kindle and those people who have read it from there and my hard copy at home have said it’s a page turner! (For anyone interested, it’s here). – and I sat down with my e-book paperwork folder, shuffled the paper around, wrote some ideas up on my whiteboard and loaded Kingston Office App on my phone. It’s a free app that I discovered that will enable me to use my smart phone as a word processor. See, I’m a bit stubborn when I have to decide doing what I want and doing what I should. Always have been. But that’s a whole topic for another day lol. The long and the short of it is that after a brief sojourn into my e-book, I have come to a solution of sorts. What I’ve decided to do is spend the next couple of weeks making felt toward the Mother’s Day markets and when I get on the plane to the UK in the middle of May for a three week trip, I’ll use my flying time wisely and complete my e-book using my new Kingston Office App (which will save me from taking my laptop and which I’ve also linked to Dropbox which is also a free program that means I can transfer my files from my phone to my home pc). I’m happy after doing what I really wanted to do: hand-dying, sewing, cutting, beading, stringing and completing a couple of new accessories. I’ve made more jewellery and dyed wool and silk and a lovely open weave scarf a friend brought me back from Thailand, and also tried my hand at covering a Galaxy phone case with a beautiful piece of blue/green felt. I managed to spill a bowl of raspberry dye all over the kitchen counter top, but after a few expletives and a lot of bleach (sorry environment), the kitchen actually looks a lot cleaner than it did before. So yeah, I even got some housework done! I won’t bore you any more with details, but will leave you with a gallery of various pics of this weekend’s handiwork.